Camco's Premium Drinking Water Hoses are heavy-duty reinforced hoses that are 20 percent thicker than standard hoses. The anti-kink design features machined fittings and strain-relief ends for added durability. The hoses are lead free, BPA free, phthalate free and UV stabilized for longer life. Made with NSF certified hose and made with drinking water safe material. CSA low lead content certified. Complies with California’s AB1953 and Vermont Act 193 Low Lead Laws. No matter the destination, this hose is along for the ride. 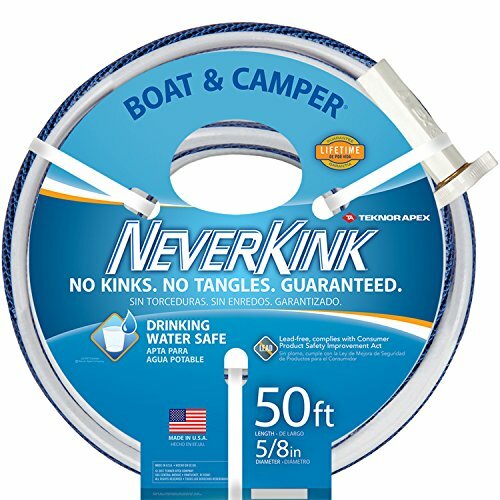 The Teknor Apex Neverkink boat and camper hose is drinking water safe and is manufactured with a patented anti-kink technology that prevents kinking. Whether you’re wheels up or anchors down, Teknor Apex Neverkink drinking water safe hoses are along for the ride. 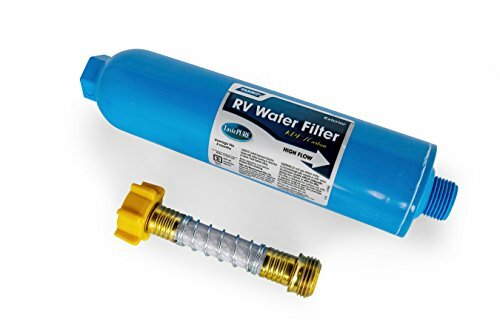 Camco TastePURE KDF RV Water Filter is a larger capacity RV water filter that lasts an entire season. Greatly reduces bad taste, odors, chlorine and sediment in drinking water with a 20 micron sediment filter. Durable in-line, exterior mount filter has a wider body to increase flow. It includes a flexible hose protector. Not designed for fish tanks or ponds. No testing has been done for this purpose. Made in the USA. Camco's TastePURE 50' x 1/2"ID Drinking Water Hoses are reinforced for maximum kink resistance. Especially useful when hooked with a Y-valve to your main faucet. Made with NSF certified hose; drinking water safe. Hose is made of PVC and is BPA free. CSA low lead content certified. Complies with California’s AB1953 and Vermont Act 193 Low Lead Laws. 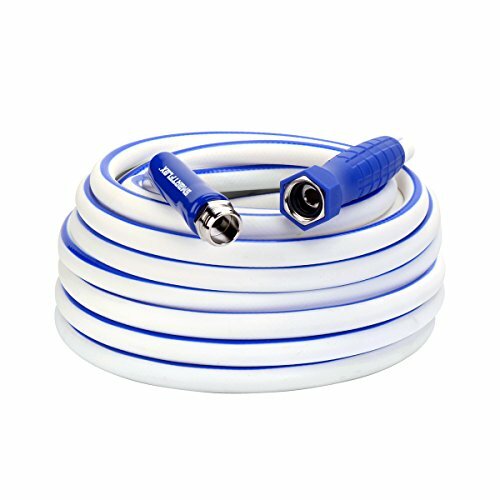 Aquaflex hoses by Apex are lead-free and comply with the Customer Product Safety Improvement Act. The ThumThing coupling provides easier attachment to the faucet. Drinking water safe; manufactured with FDA sanctioned materials. 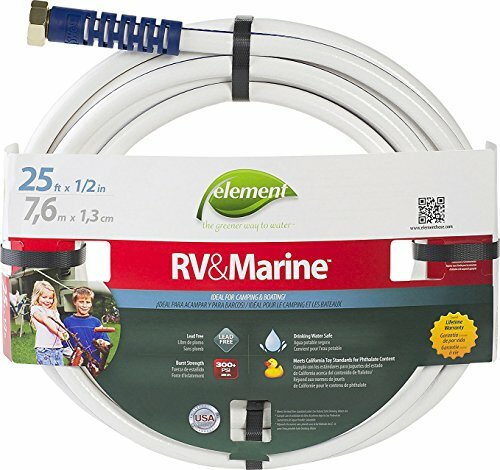 The Element Marine/RV Camping and Boating Water Hose is the ideal water hose to use while boating or camping, allowing both big and small task use. Features a powerful burst strength of 300 PSI and crush-proof, stainless-steel couplings. 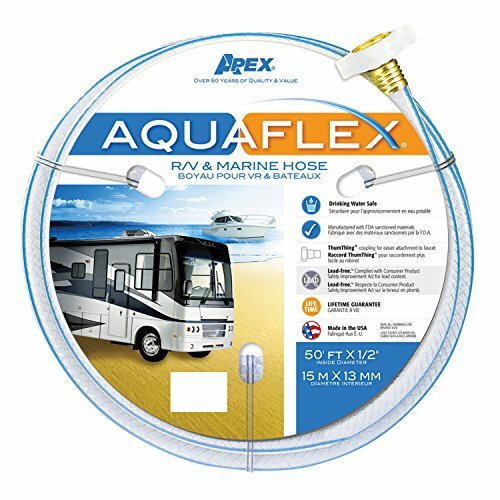 This durable, flexible RV water hose has patented hose armor that prevents kinking at the spigot allowing easy use at the campsite or marina. 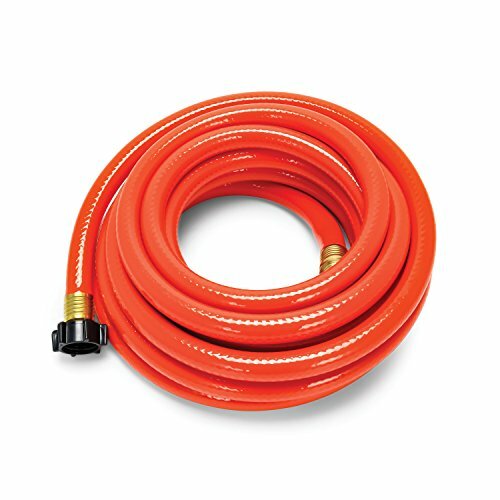 Hose is drinking water safe and meets the lead-free standard under the federal Safe Drinking Water Act, as well as California's strict standards on phthalate content so you can safely use this hose as a portable water supply line. SmartFlex RV/Marine hoses offer premium performance and flexibility at a mid-level price point. They have an abrasion-resistant outer cover for durability, and are backed by a two-year warranty. The easy grip water hoses offer superior ergonomics with a Swivel Grip handle on the female end that makes them easy to attach and detach at the spigot. 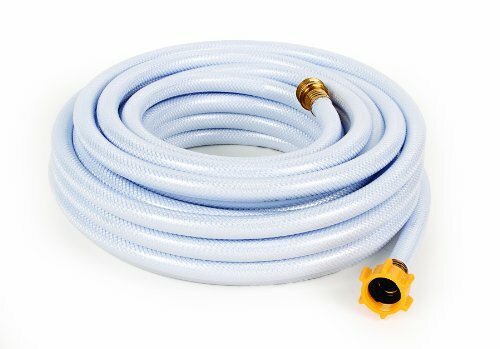 SmartFlex hoses are a great choice for smart DIY shoppers looking for a high quality product at an affordable price. 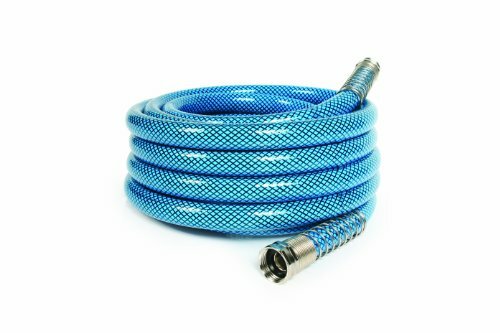 Want more Camping Water Hose similar ideas? Try to explore these searches: Outdoor Shade Fabrics, Blue Brown Area Rugs, and Red Plated Charm.